Egypt Travel representative will meet and assist you at Cairo International Airport. After that you will be transferred by a modern air-conditioned vehicle to your 5 star deluxe hotel in Cairo, Le Meridien Pyramids Hotel. Overnight in Cairo. After breakfast, transfer to enjoy the course at Kattamiya Heights Golf Resort (18 hole golf course). After that back to the hotel. Overnight in Cairo. Transfer to Cairo Airport for flight to Luxor. Checks in your hotel, then visit the Valley of the Kings, the Temple of Queen Hatshepsut and the Colossi of Memnon on the west bank. Cross the river to see the magnificent Karnak and Luxor temples. Overnight in Luxor at Steigenberger Nile Hotel. 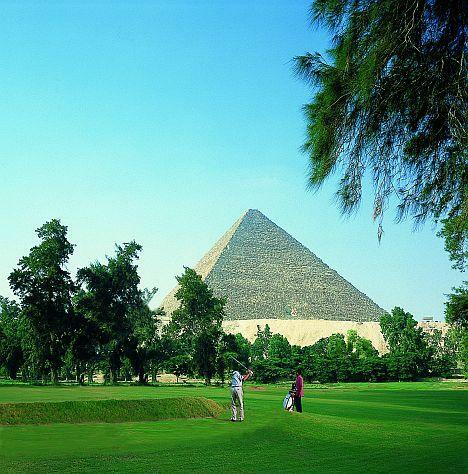 Transfer to the Royal Valley Golf Club, which offers wonderful views of Luxor west bank, for an enjoyable and challenging game (18 hole) to suit all calibers of golfers. Then transfer back to Steigenberger Luxor Hotel. Overnight in Luxor. Spend a thrilling game (18 hole) at the scenic Cascades Golf Resort at Soma Bay. The naturally rolling course features cascading water and obstacles of natural streams as well as offering stunning views of the Red Sea. Overnight in Hurghada. Accommodation for 2 nights in Hurghada including breakfast. All sightseeing tours in Cairo and Luxor. Internal flight (Cairo/Luxor – Hurghada/Cairo). A bottle of mineral water per trip in Cairo and Luxor.